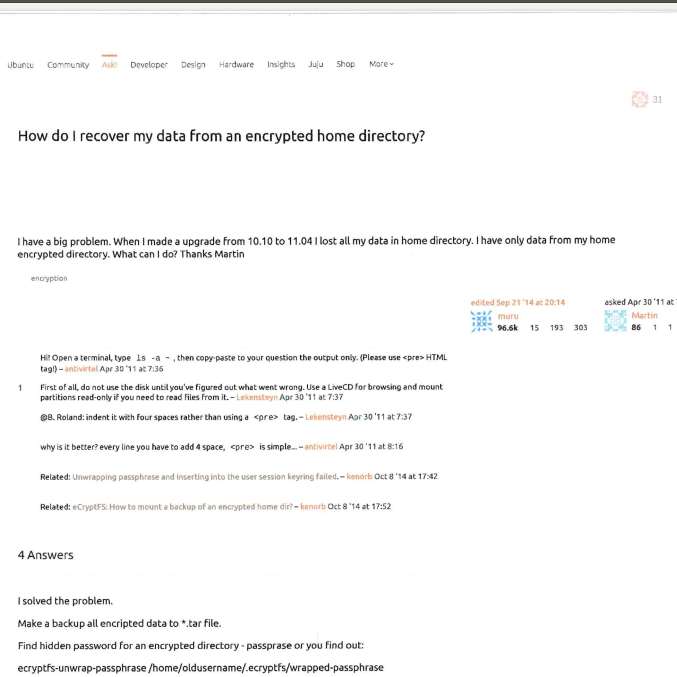 I read How do I recover my data from an encrypted home directory? and upon printing hardcopy of this, the font size is under 10 points. That is way too small to read easily. When I tried copy & paste into a word processor, that failed, too. What is the purpose of Stack Exchange sites printing in type too small to read or in Stack Exchange sites not allowing the font size to be controlled by the person doing the printing? Is it possible to add a Print feature to these sites? The image is at 100%. You may prefer the view shown by StackPrinter, which is an unofficial, community-maintained site that obtains and hosts copies of posts from Stack Exchange sites (with proper attribution) though Stack Exchange's published API, as needed, and displays them in a way intended to be better suited for printing. StackPrinter is a website that pulls the main details of a given question, all its answers, comments and votes formatting them in a simple essential printable view. See also that meta post and this other one. Pressing that first and then printing prints perfectly at 150 on my printer. Not the answer you're looking for? Browse other questions tagged support font .